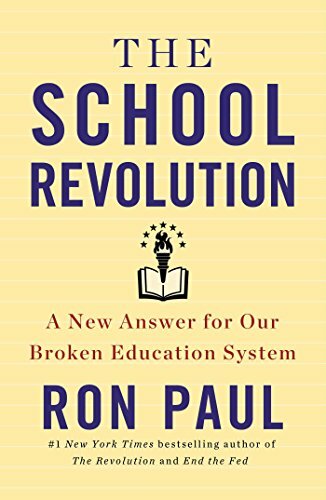 Review of Ron Paul’s The School Revolution: A New Answer for Our Broken Education System (New York and Boston: Grand Central Publishing, 2013). Allen Mendenhall is a staff attorney to Chief Justice Roy S. Moore of the Supreme Court of Alabama and a doctoral candidate in English at Auburn University. Visit his website at AllenMendenhall.com. Former Texas congressman Ron Paul has been a track star, flight surgeon, obstetrician, author, political theorist, and presidential The School Revolution:... Ron Paul Check Amazon for Pricing. candidate. Now he has written a book about American education. What motivated him to do so, and when did he develop an interest in curriculum, education technology, and pedagogy? The answer, he explains in his preface to The School Revolution, is rooted in his personal experiences as a young student in the 1940s and 50s. Dr. Paul was educated in a small public school in a suburb of Pittsburgh. He explains that he grew up when the “federal government was not yet endowed with the authority to keep us safe from ourselves,” which is to say, when the messianic character of American education had not yet set out to secularize the youth, condition them to accept the ideals and principles of Statism, and divorce them from the canons and foundations of Western Civilization. The young Paul was instructed in prayer and the Bible and never saw his peers use drugs or commit crimes more serious than skipping recess or gym class. Dr. Paul’s book is not an autobiography, despite what its opening pages might suggest. It is, rather, as its title declares, nothing less than a call to revolution. 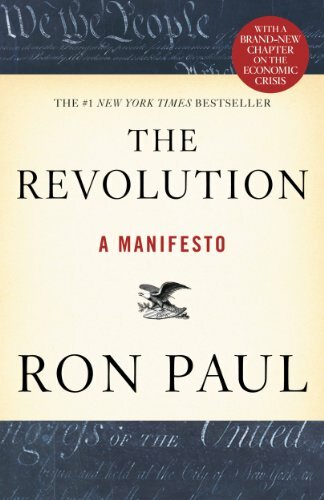 Dr. Paul says as much: “Because I see my work for liberty as extending far beyond politics, and because I see that freedom is not divisible, I offer this book as the second phase of the revolution.” The first phase of the revolution, to which he dedicated his career, was political (see, for instance, his 2008 book The Revolution), but this second phase is educational and, in that sense, foundational—for one must be educated in liberty before one may become an ambassador for liberty. The Revolution: A Mani... Ron Paul Check Amazon for Pricing. Government schools cannot cultivate the wisdom and freethinking necessary to achieve such education, for their very existence is antithetical to liberty. Against government schooling, which seeks always to validate its powers and hence to authorize the taxation and spending that sustain it, Dr. Paul presents “a libertarian view of education, from kindergarten through high school and college.” He submits that the stakes are higher in education than in taxation because “future voters are trained in the principles of who should decide on taxes.” In other words, one must learn to be aware of organized State theft (taxation) before one can effectively oppose organized State theft; however, one cannot, or cannot easily, learn about the dangers of the State from a State-sponsored system that seeks to train students into unthinking worship of the State. Government schooling is premised on the false notion that every child can achieve the same level of success if only increased funding and nationalized curricula were mandated. This ideal and its cult of followers, the most ingenuous, well-meaning of whom are decent and moral yet misguided and indoctrinated teachers and parents, have only served to delay the maturity and personal responsibility of the youth while instilling in students a dangerous sense of entitlement: when students fail, the teachers are at fault; when students cannot complete their homework, the homework is too difficult; when books are too long, the authors failed to account for their readers’ attention span. The cumulative effect of these pedagogical errors is that students come to college with no plans for their future and with little appreciation for, or understanding of, the costs of their education. 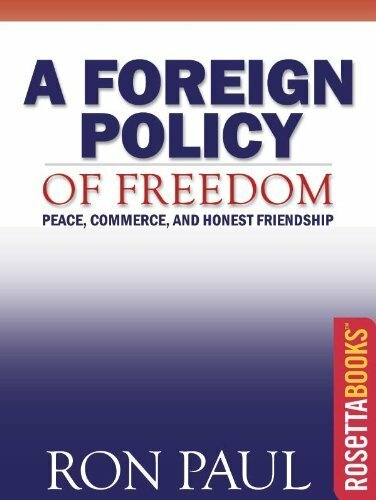 Once they incur student loan debts, they turn to the State to bail A Foreign Policy of Fr... Ron Paul Check Amazon for Pricing. them out through “loan forgiveness” programs based on “civil” or “public” service. The predatory State thereby ensures and expands its power by making perpetual, infantilized dependents of the youth, who in turn pass along the inculcated values of Statism to the next generation. Only in the hands of the central planners, those elite missionaries for Statism, could this massive, bureaucratic deformation and ideological transformation come about. “[T]he modern welfare state,” Dr. Paul says on this score, “is premised on the view that individuals are not fully responsible for their actions, and therefore they do not deserve extensive liberty.” He adds that the “welfare state winds up treating adults as if they were children,” for just as “children are not granted a great deal of liberty of action by their parents, so the modern welfare state constantly expands its authority over the lives of individuals.” The more massive and more paternalistic the government education system becomes, the less mature the students become, and the further behind they fall in their competition with students of other nations. By contrast, Dr. Paul proclaims, “[l]iberty is inescapably associated with responsibility.” Therefore, he reasons, “as individuals mature, they must accept greater personal responsibility for their actions.” Indeed, “there can be no extension of liberty without an accompanying extension of personal responsibility.” If modernity taught us anything, it was that the “most meaningful way to improve the world is to free up the creativity of individuals.” Too often our textbooks depict the history of Western Civilization as progressing in intelligence and creativity when humans were liberated from the constraints of the church—Stephen Greenblatt’s The Swerve: How the World Became Modern comes to mind, although it isn’t a textbook—but something quite different is the case: the sciences and the arts flourish when they are disentangled from State interference. Even the most memorable and talented preachers, saints, and theologians thrived when the church was liberated from the corruption and oversight of government. If Dr. Paul had limited his commentary in this book to the descriptive—that is, to the cataloguing and categorizing of failures in the government education system—then readers would be in for a gloomy account. Yet he recommends exciting, profound alternatives to Statist education and advocates for rigorous leadership training “grounded in a system of cause and effect that rewards productivity, as assessed by consumers, and [that] promotes voluntary transactions and institutions.” He urges readers to support homeschooling, an increased role for Web-based technologies in the classroom, rivaling education systems in which parents choose to place their children, the restoration of family-based practices and curricula, and drastic cost-cutting or more localized funding to finance measures in keeping with community values. No longer should parents be forced to subsidize a flawed educational system that seeks to undermine family values and capitalism that together have done more than anything else to elevate the quality of life among all classes in all places, alleviate poverty, generate innovation and creativity, develop the humanities, facilitate wider access to basic healthcare and medicine, and expand general human happiness. This book, in conjunction with the Ron Paul Curriculum, redirects us to the family and capitalism and attempts to correct decades of educational regression. As the proverb says, “Train up a child in the way he should go: and when he is old, he should not depart from it.” The School Revolution offers the children a direction in which they should go. Now let us train them. Allen Mendenhall is associate dean at Faulkner University Thomas Goode Jones School of law and executive director of the Blackstone & Burke Center for Law & Liberty. Visit his website at AllenMendenhall.com.